What if Deadpool Joined the Avengers? This past Valentine’s Day, the merc with a mouth hacked, slashed, and shot his way to a staggering $132 million weekend debut. It’s the biggest opening an R-rated movie has ever achieved. Many of the only records that Deadpool failed to break were set by other superhero blockbusters, including the Avengers movies. But what if, in some bizarre turn of events, fans were one day given the chance to see Deadpool fight alongside the Avengers in a movie mashup for the ages? Simply put, the results would be explosive. Let’s assume for a second that Marvel Studios gets the rights to Deadpool from Fox (unlikely), and let’s also assume, since the character as we know him simply cannot exist in a PG-13 movie, that Marvel is okay with an R-rated Avengers movie (extremely unlikely). With those stars somehow aligned, Nick Fury is now free to approach Deadpool and welcome him into the Avengers Initiative. The question is, what happens next? Deadpool is not a team player. If you think a personality like Tony Stark has a hard time taking orders and working with a unit, just imagine Captain America trying to order Wade Wilson around. The conflict between Cap and Iron Man has been building, and over the period of years has grown to the point that a war between them is on the horizon. 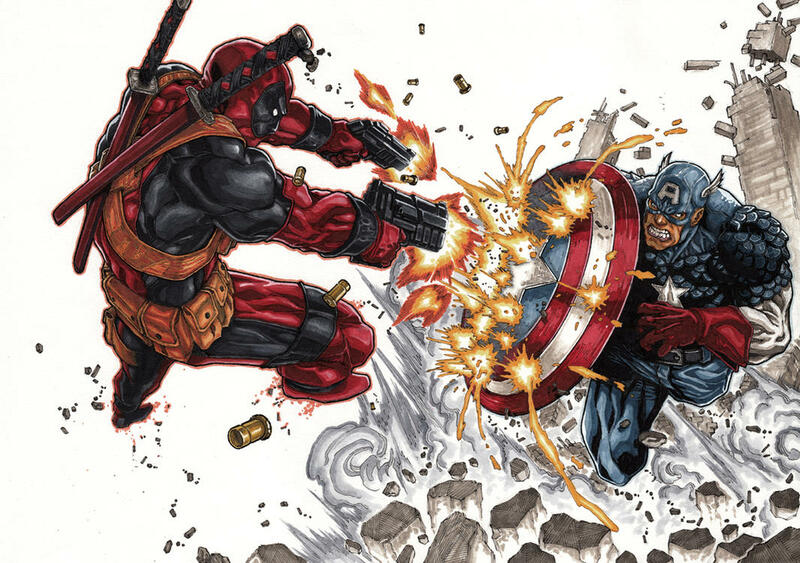 It’s a safe bet that Deadpool could probably start the same war in about fifteen minutes. Deadpool may not play well with others, but his powers would definitely bring a lot to the table for an Avengers team that is slowly being stripped of its heavy hitters. Deadpool has all the fighting abilities of Black Widow, the speed and strength of Captain America, no moral compass holding him back, and, most importantly, a healing factor that means he literally cannot die. With Thanos looming, the Avengers could certainly use abilities like that on their side. Again, that’s assuming that Deadpool didn’t destroy the team from the inside out in a matter of days—the far more likely outcome. The simple truth is that Deadpool would never in a million years be invited to join the Avengers, and never in a million years would he accept the invitation if he was. Deadpool may be a lone wolf to stay, but that still doesn’t keep us from imagining the outcomes of him joining the Avengers. Disastrous or not, it would be a movie for the ages. Whether you are a lifelong Deadpool fan or you’ve just jumped on the bandwagon (don’t worry, we don’t judge! ), be sure to check out this awesome collection of Deadpool tees.